Hasegawa House (長谷川邸) is one of the merchant houses located in Matsuzaka, Mie Prefecture. This house was constructed in the middle of Edo Period. It is a typical merchant houses with rich structures for high rank people. You can see the store parts, guest rooms, storage and gardens. Open only: weekends and holidays. Hasegawa House is one of the Matsuzaka Merchant house located in Matsuzaka, Mie prefecture. Hasegawa family had a store in Edo (Tokyo), during Edo period and made a great success in business. With their success, this house is a gorgeous structure and displays many treasures in this house today. 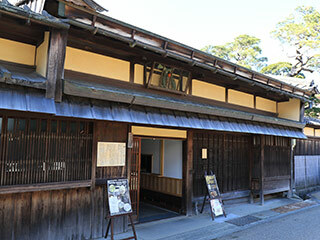 This house was constructed in the middle of Edo period and a typical merchant style house in this period. Those structures of the high-rank house is preserved in the great condition. You can see a great development of the Matsuzaka Merchant. Mitsui is one of the Matsuzaka merchants, as well.